According to a new study, dinosaurs were wiped out by an asteroid impact when they were at their most vulnerable. Dr. Steve Brusatte, of Edinburgh University, said sea level rises and volcanic activity had made many species more susceptible to extinction. They might have survived if the asteroid had hit the Earth a few million years later or earlier, he said, calling it “colossal bad luck”. The assessment has been published in the journal, Biological Reviews. The study brought together 11 leading dinosaur experts from the UK, US and Canada to assess the latest research on the extinction of dinosaurs 66 million years ago. 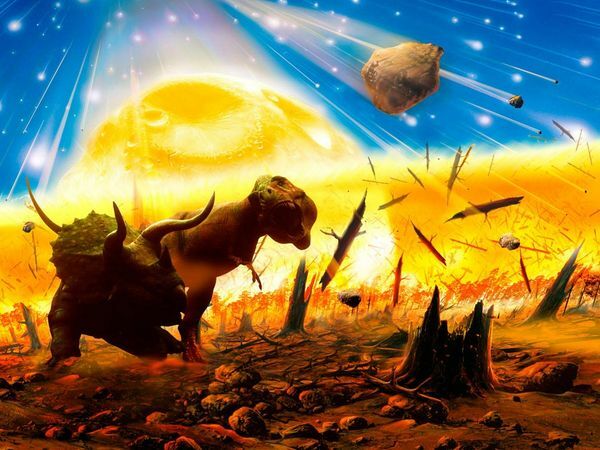 There is evidence that some species of dinosaur were dying off shortly before an asteroid hit the Earth. One of the key questions was whether this gradual decline would have led to the extinction of these animals even if the asteroid had not hit. The experts concluded that although some species of plant eaters in North America were dying out in the period leading up to the asteroid impact there was no evidence of a long-term decline. However, the experts believe that rises in sea level and increased volcanic activity made many species more susceptible to extinction just at the point that the asteroid struck. Dr. Steve Brusatte believes that had the asteroid hit the Earth a few million years earlier before the environmental pressures became worse or a few million years later, when the dinosaurs might have recovered, they would be roaming the Earth to this day. It was the demise of the dinosaurs that enabled mammals including our own species to diversify and evolve. Dr. Steve Brusatte said that if it were it not for an asteroid hitting the Earth exactly when it did we would be living in a dinosaur dominated world. This intriguing idea raises the question as to how dinosaurs might have evolved. Others involved in the study are less bullish than Dr. Steve Brusatte. They say that while his arguments are plausible they believe that it is impossible to say whether dinosaurs would have survived had the asteroid hit the Earth at a slightly different time.